Though RepCheckup equips you with plenty of templates that are ready to go, many business owners opt to edit messages to suit their needs better. 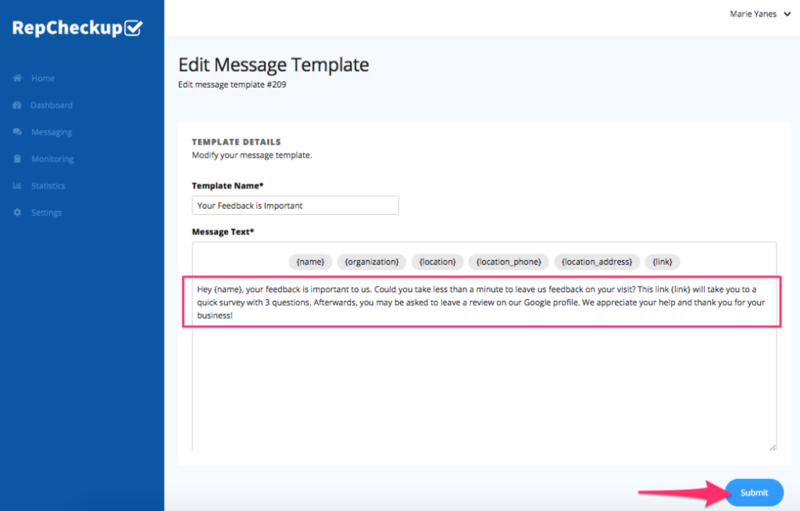 If you’d like to edit a message template in RepCheckup, you’ll have to go through a few simple steps to update messages to your liking. Navigate to the organization and location you will be working with. Select “Messages” from the blue sidebar to the left. Select “Message Templates” by clicking the blue button on the top right side of the screen. On this new page, you will find a repository of all of your templates, including pre-set ones we’ve created for you. Each template has a unique name to help you differentiate between each message. Simply select the edit option on the far right side of the template box by clicking the pencil icon to edit your template. Click “save” to make the changes permanent.